The game is fun and a surprisingly solid arcade racer but just be aware the frame rates on Switch aren't that great. I did really enjoy Cars 2 on the Xbox360 so I may enjoy this. 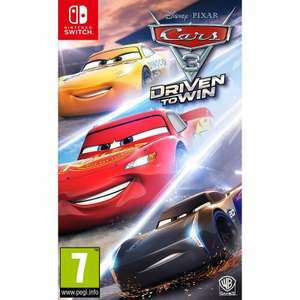 This game doesn't have the fantastic battle modes from the Cars 2 game however. I didn't see or notice massive frame rate issues. Its no Mario kart and has far less content than Cars 2 but still a decent game. No regrets in buying and still has enough to get stuck into but shame they didn't include a similar amount of playable cars as in 2. I didn't see or notice massive frame rate issues.Its no Mario kart and has …I didn't see or notice massive frame rate issues.Its no Mario kart and has far less content than Cars 2 but still a decent game. No regrets in buying and still has enough to get stuck into but shame they didn't include a similar amount of playable cars as in 2. It could be I just didn't notice to be honest... it was no WWE 2k18 anyway... it seemed to run smoothly for me... but I think doom runs superbly on it and loads moan about that. Good price and a decent game, bought it last year around Oct for £25.00 from Argos, heat added. It could be I just didn't notice to be honest... it was no WWE 2k18 …It could be I just didn't notice to be honest... it was no WWE 2k18 anyway... it seemed to run smoothly for me... but I think doom runs superbly on it and loads moan about that. Doom does run superbly, I’ve been rationing my play on it so I don’t finish it too quickly. I can’t wait for wolfenstein. Interesting, thought this was an Argos exclusive? Doom does run superbly, I’ve been rationing my play on it so I don’t fin …Doom does run superbly, I’ve been rationing my play on it so I don’t finish it too quickly. I can’t wait for wolfenstein. same - ive barely started it because I know in a few sessions I could blast through it. ha.